In the middle of 1980-ies many shook film directed by elem Klimov, "come and see". However, few know that the most brutal campaign conducted by the German invaders against the inhabitants of the Belarusian village, actually not carried out spontaneously, as was planned in advance. These killings were carried out in accordance with the plan of operation Cottbus" and instructed the special groups of the SS, the activity of which was so monstrous that was allocated as a separate item in the indictment of the Nuremberg Tribunal. The first after the Second world war, peaceful Christmas day has stood out frosty and snowy. In Nuremberg, where the autumn of 1945 was the trial of Nazi war criminals, the meeting had been suspended for 2 weeks. Many workers of the Tribunal went on a vacation home, followed their example, and journalists who covered the process. The huge Palace of justice became almost empty. It seemed that nothing will break joyful, hopeful atmosphere of the holiday. Because of the coming new year 1946 promised to become the first six and a half years without military reports, blacked out cities and artillery bombardment. However appointed immediately after the birth of a meeting of the Tribunal has made a bombshell. on January 3, 1946 Colonel John Harlan Amen on behalf of the American accusations are summoned as a witness of a man who calmly said in front of a microphone that in the period from June 1941 to June 1942 he and his followers destroyed... 90 thousand people. It was Otto Ohlendorf, the Reich protector of the SS and Lieutenant General of police, head III management RSHA (1939-1945), engaged in collecting information about the situation inside the country, the commander of Einsatzgruppe D (1941 - 1942). In an armchair in front of the microphone fell tall man, which could serve as a model of "Nordic beauty. He perfectly mastered themselves, were not without elegance, moreover, unlike many other participants in the process, gave sincere, clear and comprehensive answers. However, the content of the answers contrasted sharply with the appearance of a witness. Already after a few minutes after the start of the interrogation room, half-empty after the Christmas break, immersed in dead silence. Many of those present did not want to believe his own ears. Some even asked, not confusing anything translators? But translators are not confused. Otto Ohlendorf, the commander of Einsatzgruppe D, really was personally involved in the destruction of the so-called "inferior of the population occupied by Nazi Germany territories. The number of victims him, as he put it, "liquidation" was a terrifying figure. But even worse was more. The idea of creation of einsatzkommando (or Einsatzgruppen) was born in Nazi elite in 1938. The so-called special operations units, consisting of the SS, the Nazi agents of the police service, the SD and the Gestapo. Initially, the Einsatzgruppen were formed chief VI management Imperial security brigadef?hrer SS Walter Schellenberg by order of his immediate superior, Deputy Heinrich Himmler, Obergruppenfuhrer SS Reinhardt Heydrich. They were intended to implement punitive operations before the seizure of Czechoslovakia. Their main goal was to suppress any resistance on the part of the civilian population. In may 1941, shortly before the attack on the USSR, in Berlin have developed a special plan of operation Cottbus" on "cleaning" and "filtration" of the population in the occupied territories. Its implementation was entrusted to the office of Himmler, which controlled the business operations groups. Under an agreement signed between the Main Imperial control security and the Supreme command of the Wehrmacht, the army was ordered to assist the special units of the SS, to supply them with fuel and food, provide communication tools. For carrying out punitive operations in the occupied Eastern territories was created four Einsatzgruppen, divided between the Eastern front on a geographic basis: group a - the Baltic States; group "b" - Smolensk, Moscow; group "C" - Kyiv region; group D-the southern part of Ukraine. The composition of each group consisted of 1000 to 1200 people. Were headed by an experienced officer of a rank not below that of obersturmbannfuhrer SS, Himmler personally known and whom they trust. The group was carefully thought out. One thousand people there were approximately 350 of the SS, 150 drivers and mechanics, 100 members of the Gestapo, 80 auxiliary police forces of order, 40-50 workers of criminal police, 30-35 employees of security service. Relied also a certain number of translators, radio operators, Telegraph operators, managerial employees. For these positions were often assigned to women, who served in the SS, often they were not less than 10-15. To implement the tasks set before them the Einsatzgruppen began in early July 1941. In the instructions, which determined the range of their duties, on the first place there was the program of elimination of "persons of Jewish nationality and Commissars". Acted Einsatzgruppen very effectively. So, at a meeting in Berlin on 31 October 1941 the SS Obergruppenfuhrer Erich von Bach-o Zelewski, mandated to carry out the direct management of einsatzkommando, reported: "In Estonia, more Jews there". In General, the SS definition, any defective person was called by one phrase: "guerrilla gangs". To those attributed to random passers-by or communities, something not please the SS. Einsatzkommando spared neither women nor children, nor the elderly. German General Commissar of Belarus Wilhelm Cuba reported in the report that "the moral impact of operations the Cottbus on civilians amazing. Especially because of the large number of killed children under 5 years and even infants. The killing has always been preceded forced register with the police. As a rule, before the execution was carried out indiscriminate confiscation of property. Took everything that could somehow be used: shoes, leather goods, clothing, gold and jewelry. With fingers women ruthlessly broke the ring. Often people were forced to undress, to gather their clothes, and then shot, putting on the edge of the anti-tank ditch, fitted for the grave. All the spoil was taken into account and sent to the Ministry of Finance of the Reich. Raids and executions conducted by einsatzkommando, described by many witnesses. Terrible testimony in Nuremberg gave German engineer Herman Grabe, Director of the branch of a German construction companies in Ukraine. During your stay at the objects of his company he was in Exactly where on the night of 13 July 1942 was destroyed 5 thousand people. Grabe tried to save at least a hundred of them, proving to the commander of einsatzkommando that these people needed him at the construction. But he refused even to listen. Back in Berlin, the Reichsfuhrer thought. Of course, not about how to stop executions of innocent people. He was troubled by the question: is it possible to make the "shares" less psychologically traumatic for their performers. After all, the soldiers and officers in einsatzkommando, as a rule, married people. And they have to take on the fly women and children. Won't this in the future on their psyche? Will the bias? Himmler was very concerned. After gathering the technical staff, the Reichsfuhrer ordered them to come up with a device that could carry the death penalty without the effective participation of performers. 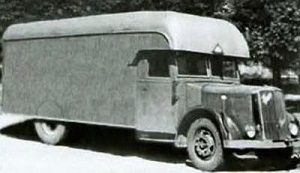 Just then one of the engineers, untersturmfuhrer SS Dr. Becker, and suggested the idea of the machine, which later received the name "the truck dreams". As soon Becker has completed development of the machine, obersturmbannfuhrer Rauf responsible for road transport in the Main Imperial government security office, was asked to organize its production. Order received automobile plant Saurer. In the documents of the car became known as "the truck's" (the first letter in the name of the manufacturer and the first letter of the word "sonder" - special). In the Einsatzgruppen these machines appeared in the spring of 1942. Engineer Becker was appointed head of the Department, public liability for the operation of trucks. Apparently they did not differ from usual indoor car, but were designed so that when you start the engine exhaust gases were in the truck, causing the death of people setting there in 10-15 minutes. Spichrzowa worked non-stop. As was mentioned in one of the reports, only in Ukraine with the help of "machinery of death" was destroyed 340 thousand people. The use of such equipment were kept in the strictest secrecy. Even from members of the operational commands concealed the true scale of their parts, he was known only in Berlin. In Minsk one driver, probaltica about the "gas chamber", was sentenced by the Tribunal SS to capital punishment. In 1944-1945 all trucks dreams" were destroyed. It would have gone all information about the terrible acts of Einsatz-groups, but quite by chance in one of the warehouses of the enterprise Saurer allies were found spare parts for the car "S". With this he began the investigation, which revealed the horrifying facts, used during the Nuremberg Tribunal. Back to Otto Ohlendorf. This man could pose for any Goebbels poster promoting specimens "true German shop". Olendorf gave the impression of a man's thinking and intelligent, has great talent. He had higher education, graduated from two faculties: law and Economics. Managed to make a fantastic career. In the 33 years he became the head of the third Department of the Reich security service and received the rank of SS General. More often sat at the Desk, than stood by the graves, looking around over the execution team. War Otto Ohlendorf finished in another office. Not paladin with Deputy Himmler Ernst Kaltenbrunner, he moved to the Ministry of economy for the position of expert on foreign trade. The case aulendorfer was not isolated. At the Nuremberg trials before the Tribunal appeared 24 of the commander and officers of einsatzkommando. The result of the activities of the Einsatzgruppen still not announced. Archives of the Reich were destroyed, many of burial has not yet been found dead at the hands of the SS people still reported missing. According to rough statistics, the number of victims 4 operational groups only on the territory of the USSR, excluding Poland, Czechoslovakia and other countries, is about 750 thousand people. The mass destruction of the representatives of "inferior races" were committed in execution of the order of Adolf Hitler set out in the General Directive to the plan "Barbarossa". "Not only justified, - pointed Fuhrer, but it is the responsibility of the SS use of all without exception of means of struggle, even against women and children, only that it was successful. Any considerations of an opposite nature, whatever their nature, are crimes against the German people". Так что такое бозон Хиггса? You are reading news Команды смерти if You liked the article Команды смерти, prokomentiruet her.